You might of heard in recent years about the benefits that come with diesel fuel. After buying a fuel-efficient vehicle, these benefits might even tempt you into mixing up the different types of fuel in your car. For instance, diesel is said to get upwards of 30% higher fuel efficiency than gasoline. That increase in fuel efficiency could turn your already efficient Prius running at 50mph, into more like 65mph; thus saving you hundreds at the tank per year. Although the increase fuel efficiency might be tempting, you should never insert diesel fuel into a gasoline engine, or vice versa. Attempting to do so?even accidently?could cost you a lot of money to pump the engine, or worse, buy a new engine. Diesel and gasoline fuel are sold separately for a reason. It's not because one is more of a luxury premium than the other, but because they go through a different refining process. 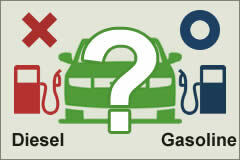 Both fuel sources come from a product known as crude oil that is pumped from the ground. Diesel is a much heavier, dense, and oily substance whereas gasoline is much lighter. Another thing that is different about the two fuel sources is their compression ratios?or how much of the fuel source can be contained within the engine. That higher the compression, the more fuel you can fit in the engine and the more powerful the vehicle will be. In gasoline engine, the compression ratio is anywhere from 7:1-10:1, where 10:1 is most like the highest you'll find. In diesel engines on the other hand, the compression ratio can be as high as 23:1 making it a much more powerful engine. When the spark plugs inside a gasoline car ignite the gasoline, it vaporizes very quickly which causes the pistons to turn and the car to move. Since diesel is so thick, spark plugs aren't able to vaporize the substance quickly enough and the engine simply won't run. If by chance you are able to get the engine running because the compression ratio of the diesel fuel is low enough, chances are it won't run very long, and if it does you run the risk of burning a hole in the pistons. In diesel vehicles, there are no spark plugs but instead the engine is designed to inject larger amounts of diesel fuel into the chamber which is superheated. Due to the incredibly high temperatures, as soon as the diesel fuel makes contact with the chamber it combusts and the energy released is what causes the pistons to move. The density of the gasoline is what allows it to withstand the heat just long enough so that it is perfectly timed to combust at the right moment. Since gasoline is so light, it would cause the combustion to occur too early, which would reduce the amount of power being produced. Although putting gasoline into a diesel engine won't immediately cause repercussions like putting diesel in a gas engine would, the gasoline would start to destroy seals within the pumps and ruin the engine. The best precaution that you can take against making this fatal flaw is just to pay attention. When driving around a diesel or gasoline operated vehicle, you need to be especially cautious to make sure that you know which pump goes to type of fuel. Thankfully in recent years, gasoline manufacturers and gas station owners have taken note of this problem and have designed a pump system aimed at reducing the number of accidental mistakes. Gasoline pumps are now designed to be much smaller than diesel pumps, and diesel pumps are fitted with a special plate that prevents any unknowing driver from accidently filling their car with the wrong type of fuel. For older vehicles that don't have this precaution, if you realize you inserted the wrong type of fuel, don't try to drive it until you've pumped the gas tank clean. If you start the car, the fuel will start to run through the fuel injectors and fuel lines and the repair process could be more expensive.